If it works as advertised, this program is going to make a lot of Notes users on the Mac very, very happy. 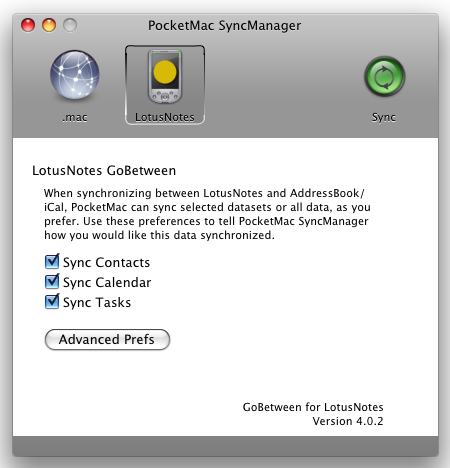 For $25 PocketMac GoBetween for Lotus Notes will sync all of your Lotus Notes PIM data to iCal and Address Book. You can then run iSync to sync iCal and Address Book to your mobile device. And it works both ways, you can add/change/delete data in iCal/Address Book, in Notes, on your device and still keep all of them in sync. I have just installed with the Notes 8.5 beta. Seems to work ok so far. I will post if I see anything not working correctly. Update - I may have spoken too soon. Contacts came accross ok, but the product became unresponsive when trying to sync calender. I shall continue to play and post on my site when I have finished testing. I have been praying for such a tool for years now (sinc kissworks is defunct). 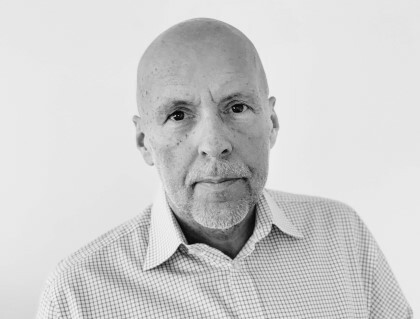 Now it was easier to leave the company I was working for during the last 18 years than syncing Lnotes with iCal, which I did (that was not the motivation, though). At this precise moment it apears - what a coincidence. And I was a user of Pocket sync before... aaarrgh. Great tool it seems,...if you own a MAC,...anyone know of a win version ?? What would you want the program to do? There is neither iCal nor Address Book nor iSync on Windows. I've been trying to get this to work, however it never connects to the Notes Server. I can't see how to give it the appropriate credentials to be able to access my mail file. it crashs all the time, I had no success. Syncs Adressbook but unable to national characters - a problem simillar to the German one posted Feb 23. Calendar sync just crashes. finally opened my Feedreader again ... and there ist was! Been looking for this. But as I read the comments ... autsch ... I'll wait and keep sYncing via a PC in the corner of the office. Pretty akward to be sYncing your iPhone over a PC with your Notes, while the Powerook is sitting in front of you shrugging with it's shoulders. I hope someone get's on top of this problem one of these days once and for all. I have the same problem described by Frank Jennings - it aborts with the error message "Could not start Lotus Notes server". I have tried using local replicas of mailfile, to no avail. Raised a support ticket on fri, no reply as of yet. Also I could not figure out where to give it the password for accessing the mailfile - thanks to anyone who can enlighten me. Oh, will ever Nokia release a PCsuite for the Mac (should be called Macsuite, then, I guess) so that the marriage between my Mac and my N95 does not have to be consummated only through a Virtual Machine ?? I have "all of the above" problems with the last version of GoBetween LN, errors, cancelations, national charaters data corruption, duplicate appointments, duplicated contacts, etc, etc. I have 10 installations in our company, no one runs fine, it fails different on each system. I contacted the PocketMac company, however they dont have an satisfactory answer, only "we will have a new version on the future"
There is no alternative, it the only product on the market, or not? I bought this 'tool' last weekend with googling a little first. Big mistake. Note to self: Never do this again. If I'd done my homework before, I would have found out that there's no one in any forum/blog/... who actually managed to use the program as advertised. Well, at least they have a money-back guarantee, which I will test now. Uninstalling GoBetween will surely be another interesting adventure.